While the exact duties and requirements are not identical for all General Manager of Operations positions, there are certainly some similarities among positions with this title. The sample job description provided here can be a good starting point for writing a job description for your company, or if you're considering applying for this kind of job, it can give you a good overview of typical requirements. 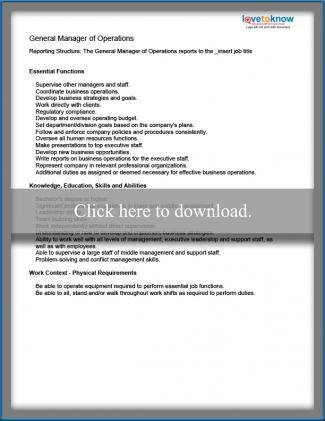 To access the sample General Manager of Operations job description, simply click the image and the document will open as a PDF, either in a browser window or as PDF file, depending on how your system is configured. If you just want to get an idea of what's involved in this type of work, simply print or review the duties on screen, keeping in mind that exact duties vary greatly from one company and position to another. If you are working on creating a job description, you can easily customize the PDF to meet your specific needs, removing items that don't apply and adding new ones. Save the job description to your computer or external storage device via the "File" menu or by clicking the diskette icon on the toolbar. You can make edits to individual lines by clicking in the highlighted text of the item you want to change. You can remove lines that don't apply to your situation by clicking the "X" at the end. When you are finished, save the document again. To print, click the printer icon in the toolbar or access the "Print" command via the File menu. 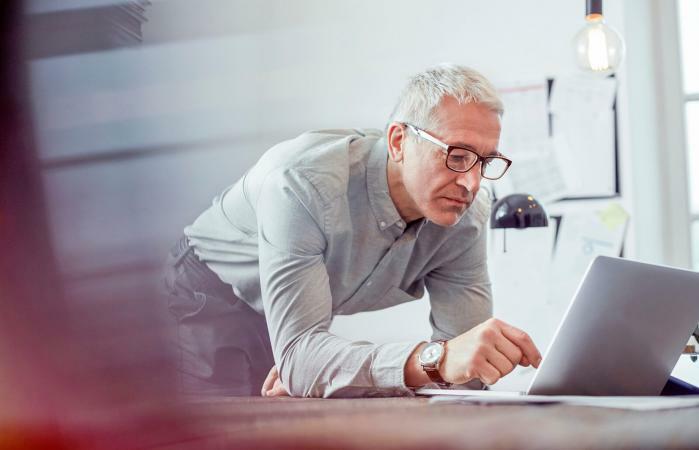 Duties are assigned to General Managers of Operations differently from one company to another, and job descriptions must be specific to the exact position they are used for. While reviewing this sample can be helpful to job seekers and personnel tasked with writing job descriptions, chances are that it won't apply verbatim to most specific jobs. Use it as a starting point, realizing that differences in company needs and structure have to be taken into consideration when defining the role of an operations manager in the organization. See Examples of Job Descriptions for a Manager for sample text for other types of supervisory jobs. Job descriptions do more than communicate duties and job requirements to employees. They should be used to make hiring and promotion decisions, as well as to evaluate the performance of employees. Because of this, it's critical that they are both accurate and legally defensible. If you decide not to hire, promote or retain someone because he or she cannot perform the essential functions or does not have one or more job requirements, the position description - and what you do in practice - needs to reflect that fact. Don't put information in job descriptions that isn't accurate, and hold employees accountable for performing as required. Before adopting a new job description for your company's General Manager of Operations - or for any position - have it reviewed by your company's employment law attorney and follow it consistently once it's put to use.